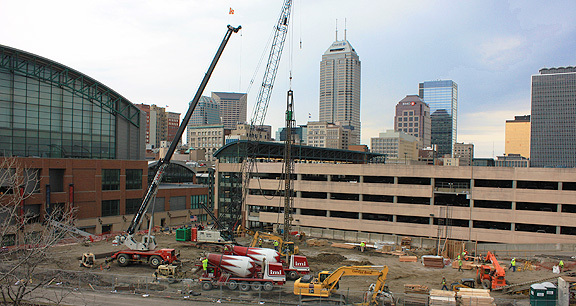 Project obstacles and solutions: The Indianapolis Capital Improvement Board announced in 2015 that it had approved a new practice facility for the Indiana Pacers. The $50 million, five-story structure will be known as the St. Vincent Center. It is located adjacent to Banker's Life Fieldhouse. FA Wilhelm is serving as the general contractor. Leon Beaty Construction is handling the foundation work on the project. The new practice facility is being built over a former parking lot. The design requires 341 structural caissons to be drilled 60' below grade to form a deep foundation. Beaty Construction used an auger to drill the caissons. Concrete was pumped into each shaft as the auger was backed out. Two factors were critical in this pour. The mix had to be placed below the surface of the pooling concrete. Otherwise, the walls of the caisson could collapse into the hole as the auger was backing out of the shaft. The mix also had to be fed continuously. If there was a momentary break in the flow of the concrete, debris could fall into the space and weaken the structure. IMI supplied a 4,000 psi grout mix that was placed at an 8 inch slump. Two mixer trucks fed a concrete pump connected to the auger during each deep foundation drilling. The two trucks ensured that the concrete would flow without any stops due to mechanical issues. For more information on pouring specialized foundations or grout mixes, contact the sales representative for the plant nearest your locations. Click here.